NINJIO will donate $35,000 to seven of our clients based on the engagement of each company, in their respective size category, measured on December 31st, 2019. In January, we will award $5,000 to each of the winners, to donate to the charity of their choice. It’s up to you to make your charity win! NINJIO’S underlying passion is to help people, and by helping people, we are helping companies. There is another tug at our heart string and that is to help people outside of security and to support the programs that our clients support. There will be 7 NINJIO clients who will have an opportunity to do this through our NINJIO Cares program. This program started officially in 2018, and we have awared our winners for 2018! Any client who is running the full library of NINJIO (i.e. not “pack” users) and is launched content by April of 2019 is eligible for 2019. *If there is a tie, when picking the winner, we will first look at engagement, and we will then look at average number of points per user. The higher number of points per user will win. Points are based on consuming the episode quickly after it’s released, and scores on the quiz. 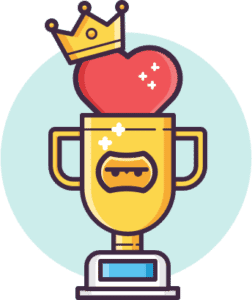 On December 31, 2018, we measured overall engagement for each company, in each category, and the top winners in their category were notified that have been awarded a $5,000 check made payable to the charity of their choice, on behalf of the company and NINJIO. There were 5 different winners, as our top bracket clients didn’t submit their numbers. In order to be included in the NINJIO Cares contest, you must have signed up with NINJIO by March 2019, so that your numbers from April forward will count. For companies who are NINJIO Enterprise (Content Only), we require that you print a report that shows your overall engagement through December 31, 2019.